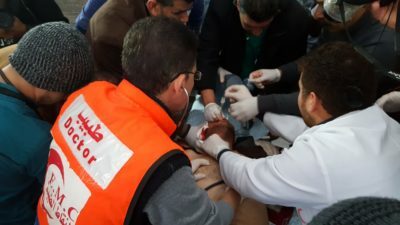 The Palestinian Center for Human Rights (PCHR): On Friday evening, 28 December 2018, Israeli forces Killed a Palestinian civilian with disability and wounded 18 other civilians, including 4 children and 2 paramedics (female and male), in the peaceful demonstrations in the eastern Gaza Strip despite the decreasing intensity of the demonstrations there for the ninth week consecutively and absence of most means usually used during the demonstrations since the beginning of the Return and Breaking the Siege March 8 months ago. According to observations by PCHR’s fieldworkers, for the ninth week since the beginning of the Return March on 30 March 2018, though the demonstrators were around tens of meters away from the border fence, the Israeli forces who stationed in prone positions and in military jeeps along the fence continued to use excessive force against the demonstrators by opening fire and firing teargas canisters at them, without the later posing any imminent threat or danger to the life of soldiers. According to PCHR’s documentations, the civilian killed was the 8th one of persons with disabilities, who were killed by the Israeli forces during the Return March. At approximately 14:30, thousands of civilians, including women, children and entire families, started swarming to the five encampments established by the Supreme National Authority of Great March of Return and Breaking the Siege adjacent to the border fence with Israel in eastern Gaza Strip cities, except for northern Gaza due to bad weather. Hundreds, including children and women, approached the border fence with Israel in front of each encampment and gathered tens of meters away from the main border fence, attempting to throw stones at the Israeli forces. The Israeli shooting, which continued at around 17:00, resulted in the killing of a civilian identified as Karam Mohammad No’man Fayyad (26), from Khan Younis. Karam was hit with a live bullet to the head at approximately 16:00, while present around 150 meters away from the border fence. He was then taken to the European Hospital, where his death was declared at approximately 18:00. Karam’s family said that he was suffering from mental disorder. Moreover, 18 civilians, including 4 children and 2 paramedics (female and male), were wounded. In addition, hundreds suffered tear gas inhalation and seizures due to tear gas canisters that were fired by the Israeli forces from the military jeeps and riffles in the eastern Gaza Strip.